For the first time, a president declines to seek a new mandate without being defeated in a general election. 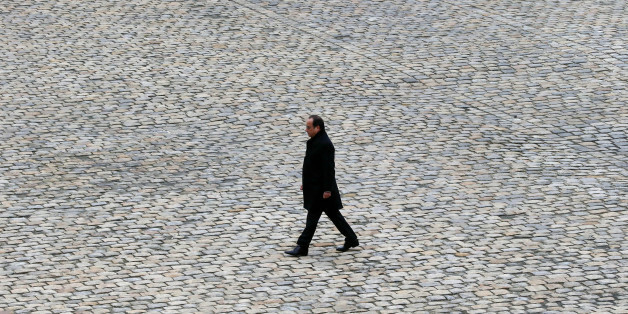 As he stepped down, in the interest of his country and the well-being of his political family, François Hollande was very emotional. On Thursday night, Hollande had the flat voice that can only belong to someone who is aware that he's making the most painful decision of his professional life. His expression was lackluster, but he managed to remain eloquent. And given his track record, and the situation in France, he added the elegant touch of regret. He expressed regret about an unemployment rate which he announced too early and too quickly to have improved. He also showed regret about fracturing the left without uniting the country -- with the the question of snatching citizenship away from terrorists. History will remember the president as someone who knew how to break from the typical course of action dictated by ambition and power. This year is the most unpredictable we have seen in quite a long time. In less that two weeks, France turned the page on a story that was thought to have been already written. It parted ways with two presidents and a former prime minister; it reshuffled all the cards and rendered the future uncertain. Time will reveal if Marine Le Pen will be able to cause the greatest political earthquake in France since the Liberation. At the beginning of this presidential campaign, there was not a single situation that could be taken for granted. The French, who have become tired of the opposition to change and conservatism, flipped the table around. On the right, there was a shift away from the favorite and the perennial candidate. On the left, the same sentiment was expressed even without a vote, as the polls were sinking lower and lower. This will not be without consequence. For the first time, a leader will have been eliminated without being defeated in a general election. The French were clearly angry; the opinion polls gauged the drop in popularity on a daily basis. His adversaries began forming coalitions against him. And a book, which he wanted published despite it being impolitic, finally brought him down. There will be five months, starting today, during which to comment on the episodes to come in a campaign which promises to be decisive. This will be the time to evaluate what the chances of the reformism of Manuel Valls are with respect to the final battle. Time will tell if Arnaud Montebourg or Benoit Hamon can completely shake up what remains of the Socialist Party. We will also see if Jean-Luc Mélenchon will succeed in his political gamble to become the new pivot around which the left will organize itself. This will be the time to verify Macron's candidacy as a non-aligned, centrist leader. Time will tell if François Fillon will be able to unite France, beyond the 'non' to Sarkozy. And time will reveal if Marine Le Pen will be able to cause the greatest political earthquake in France since the Liberation. But for now, let's meditate on François Hollande's "Chant du départ." It will obviously not be a victory anthem as that written by Méhul and Chénier in 1794. But in its melancholy, there was, as Christiane Taubira correctly put it, "a moment of dignity just as politics had become mean."